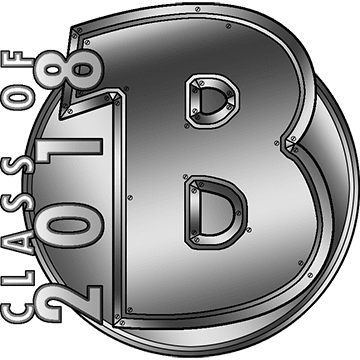 Click here to go back to Chapter 1. The moment that many of us have been waiting for since 4.0 has finally arrived: We get to find out what's going on in the Sith Empire and the Republic. Well, one of them anyway, as the Outlander visits Empress Acina on Dromund Kaas to discuss the possibility of an alliance. With the Alliance. This is going to be a bit of a pain to talk about, isn't it? While Acina tries to convince you that allying with her is a good idea, the shuttle suddenly gets shot down. You manage to jump out before it crashes but find that communications aren't working as they should, so you can't call for help. Meanwhile, you (the player) see an incredibly chipper Minister Lorman tell Theron and Lana that you and the Empress have died in a tragic accident. When you and Acina reach the shuttle crash site, you find that the emergency beacon is destroyed and a party of GenoHaradan scouts is looking for you... to make sure that you're dead. At the same time, Theron receives a call from former Republic Chancellor Leontyne Saresh, also offering her condolences about the Outlander's "death" and suggesting that her leadership skills would be a big boon to the Alliance. Theron and Lana say eff to that and decide that they really need to find you (alive, preferably) as soon as possible, even if the bad storms will make it difficult. Meanwhile you traipse through the rainy jungles of Dromund Kaas with Acina to find the GenoHaradan's camp. When you do, you also find a datapad which reveals their employer: none other than Saresh herself. (Republic players who did the story mission for the Scum and Villainy operation probably already suspected this, as Saresh was shown to be their last known employer back then.) Immediately after this discovery a shuttle with more GenoHaradan shows up and they try to blast you straight from the sky, but you manage to scurry away into a nearby ancient Sith tomb before its entrance collapses behind you. On the Eternal Throne, we see Scorpio informing Vaylin that rumour has it that you're dead. Vaylin shrugs this off as obviously false, but Scorpio informs her that the upheaval caused by the Outlander's disappearance is the perfect opportunity to strike a blow against the Alliance. Back in Kaas City, Lana and Theron's attempt to sneak off to search for you is thwarted by some guards that Minister Lorman posted in anticipation of this move. 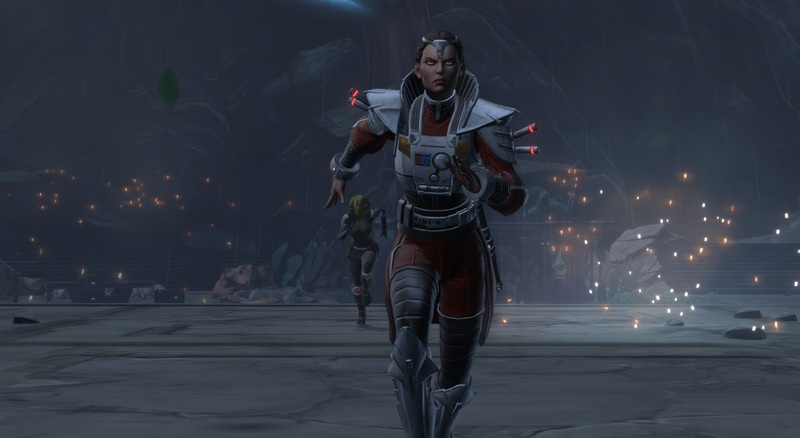 You and Acina make it through the ancient Sith tomb, avoiding a bunch of traps and vicious critters along the way, just to run into the leader of the GenoHaradan accompanied by "Minister" Lorman at the end. As soon as you defeat the GenoHaradan, Lorman tells you to stay back as he claims to have your friends as hostages, but when he tries to prove this via holocall, it turns out that Lana and Theron have easily overwhelmed their captors. 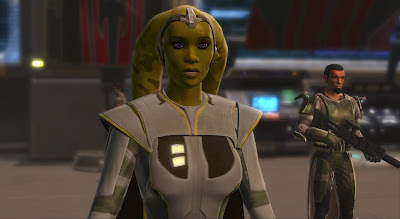 They tell you that Saresh is already on her way to Odessen to instate herself as the Alliance's new leader, leaving you to only deal with Lorman before hurrying back yourself: You can let him go, encourage Acina to make him her slave, or team up with her to execute him. On Odessen, you bust in on Saresh, just as she announces to your Alliance that you're dead. She panics and tries to run, but of course you stop her with ease. She expresses no regrets about her actions, and you get to punch or even kill her, though you can also simply take her prisoner. Theron will love you for it either way! 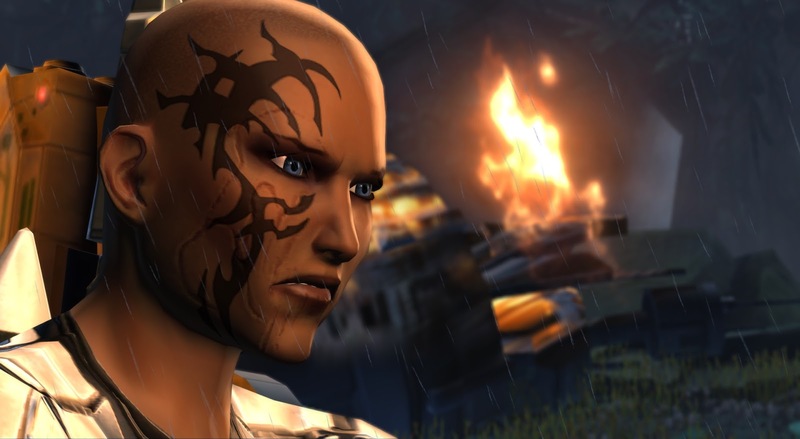 Acina calls in one more time to apologise for everything that happened on Dromund Kaas and asks whether you'll still agree to an alliance with the Sith Empire, which you can either agree to or refuse. The chapter ends with a view of a small freighter being chased by Eternal Fleet ships and a female voice calling for help. 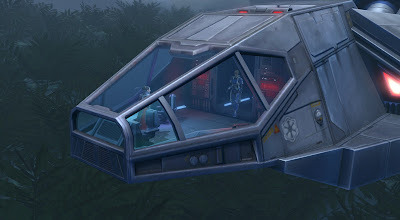 The Gravestone appears and Koth comes to its rescue, but as he takes the damaged freighter in for repairs, we see that its crew consists of none other than Scorpio, who was merely impersonating the ship's former captain, Vaylin and some of her troops. I was one of those people who has been waiting to get back to the story of our original factions, so I was initially delighted by this chapter, but I finished it with a sense of bitter-sweetness. While it's great to return to an iconic starter planet like Dromund Kaas and see for yourself how the Sith Empire is holding up under its new Empress' reign, the chapter only goes on to cement your position as an outsider in this brave new post-KotFE world. Acina lectures you about how the Sith used to do things vs. how they do them now, which leaves Imperial characters wanting to scream: "I know all of this! I'm one of you, remember?" There is no way of seeking true reconciliation if you still consider yourself loyal to the Sith Empire. While the chapter focuses on the Sith, Republic characters aren't really much better off in terms of connecting to their old home. As a trooper in particular I found it absurd that Saresh would seek to assassinate me after I had defeated one of the Empire's greatest generals in service to her, but I don't imagine it feels much better if you're a different flavour of hero of the Republic. Didn't she give the consular a medal at the end of the original class story? Those bigger issues aside, "Run for the Shadows" is another chapter that finds a good balance between story and gameplay. The character of Lorman is pretty funny and his over-the-top outrage at not being addressed by the correct title was a genuine laugh out loud moment to me. The Sith tomb also contains a bonus mission that requires the use of binoculars, which can additionally be used to spot and avoid traps. I completely missed that second use the first time around and just stepped into every flame and onto every spike like a noob, but it's nice to have another optional bit of puzzling thrown into the mix. Speaking of traps though, what's that about Koth running straight into a trap...? Madon's complete and total personal absence in the story is getting rather annoying. It's one thing that we first heard about him in a mere Alliance Alert, but at this point it's just getting ridiculous. "There is no way of seeking true reconciliation if you still consider yourself loyal to the Sith Empire." I haven't played this chapter on an Imperial character yet, but that would bother me so much! It doesn't make any sense for an Imperial force user. How cool would it be if it were to be different for those players? Things like this are the only let downs for me in an otherwise amazing (story writing wise) expansion. Usually I try not to get too hung up on things from the past when it's clear that the devs have moved on, but I want my Republic vs. Empire back. :( It's just such an iconic part of Star Wars, and they did such a great job at bringing the two factions to life in the original base game. Zakuul and the Alliance just appear lifeless to me in comparison. Agreed. (and yes, I've decided to poke at the game just to check out the story) It feels like they are trying to introduce moral ambiguity and all these extra angles to a universe that really doesn't need it. Plus, I... kind of like Saresh. I like my Republic a little uncompromising, too, and she's done good work as governor of Taris. Did you try the thing on veteran? It's by far the toughest of the chapters, and the final fight turned into quite a trial of willpower for me. Yes, and I've been meaning to write a post about that, thanks for the reminder. The short version is that it was very tough but fun for most of the chapter, but the last fight kind of broke me. I spent an entire afternoon trying to beat it and accumulated repair bills for several hundred thousand credits but never got any further than killing one of the Mercs. In the end I asked my pet tank for help to finish that fight so I could move on. I'd still like to try my hand at it again later, but as I was using that playthrough as the guide for my write-up, I just wanted to get it done for the time being. Public support for the "terrorist" Outlander could result in Coruscant being the next planet "bombed to ashes". I'd even understand if the Jedi were concerned about my Guardian's activities. I'm training Sith at my compound! In general, I think our writers discount just how controversial all these things we are doing are. If you replay the early JK story, you'll drink in a bunch of anti-Sith sentiment, and say a bunch of anti-Sith things. We certainly treat the Sith differently these days. Who would bomb Coruscant after Zakuul has been defeated? And I get that the Republic might have reservations about some of the Alliance's actions, but we're talking about the same Republic here that sent a strike team of Jedi to attempt to redeem the Sith Emperor. Yet they are afraid of even trying to talk to a former Republic hero? 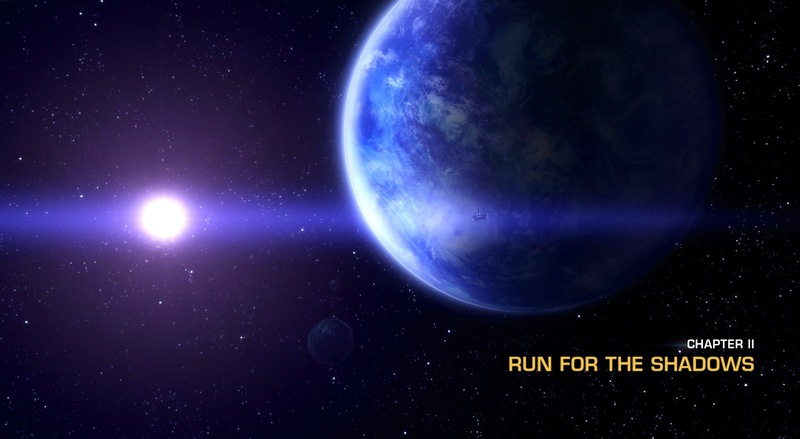 At this point in our timeline, Zakuul hasn't been defeated, only the leader changed. Also, we don't know the true nature of Chancellor Madon. Aric Jorgan called him "Saresh's puppet." Is he the next guy who's gonna try and assassinate us to lead our followers? Most of the Jedi order is gone now. I pretty much assumed that most of those who are alive and willing to fight are already sitting in my enclave. Tython would just have a few holdouts who don't approve of my willingness to work with Sith.